God has a plan for the world that calls for the full-on engagement of His agent, the Church. Now is the time. Are you ready? There's one thing God loves that, when we do it, grows our faith perhaps more than anything else. Find out how this "one thing" can transform your spiritual life and bring you joy in the process. What shapes your views on wealth, money and giving? The Wall Street Journal? Money magazine? The balance in your bank account? Discover the biblical perspective on these topics and how to apply them to your life. What's the measure of your heart? Jesus lays out a clear way to answer that question by looking at where you give your affection, your attention and your allegiance. What's your "first language" when faced with a seemingly impossible situation or decision? Learning the language of faith can be difficult, but the spiritual results are worth it. One woman’s over-the-top gift for Jesus is a remarkable example of extravagant giving. How do we feel about giving what we treasure most to Him? Giving usually costs us something. Have you ever considered what it cost Jesus to be the sacrifice for our sins? A popular commercial coined the phrase “more is better.” Applied to the Church, the more unified we are, the more we can accomplish for God’s kingdom. More really is better! 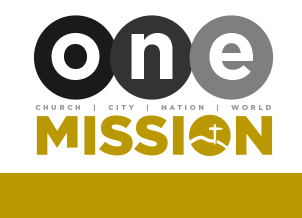 God has been moving and transforming lives through One Mission. In this initiative we look at we are grateful for, but also how we can continue to bless others through Christ.